Internet is becoming more and more widely available especially in emerging countries and more and more people now make use of public Wi-Fi offerings, more so when they are on the move say hopping across countries, or for that matter everyday travel and so on. While it is a good thing to make use of it to save some cost it can also be a very dangerous proposition when venturing into a 3rd party Wi-Fi zone as you never know what would lurk into your work or who is tapping into all of the incoming and outgoing information! Even with the normal data connections on your phone you never know who is lurking somewhere not known to you, trying to get a glimpse of your data and other details, while you are blissfully unaware of it. The best way is to have a VPN shield with you when required or all the time is even better! 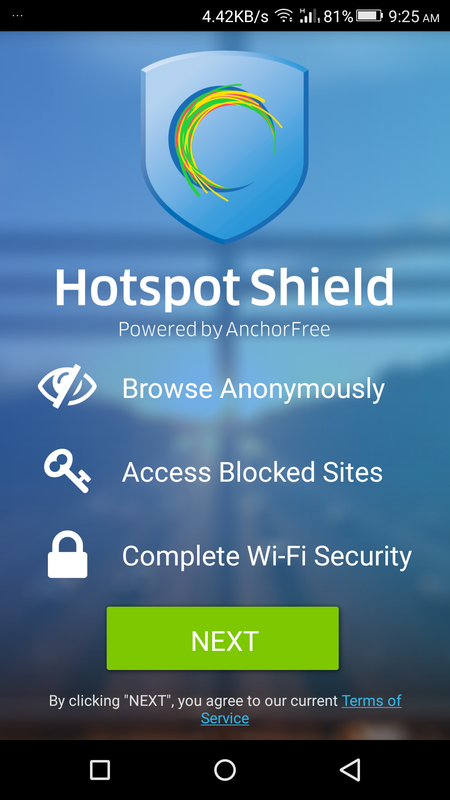 There are tons of options out there in the Google Play store but today we will be diving deep into one of the best ones out there – Hotspot Shield VPN by AnchorFree. This app is available on the Apple’s store as well but we will confine ourselves on the Android platform. You can download and install the app from the Google Play store. If you have a code for the ELITE version, you can head over to the official website to activate it or may be purchase it for that matter. Open the app, while making sure you have an active data connection or a WiFi on. The landing page will tell you that the app hasn’t kicked in yet and you will have to start it. Tap on the “Start” button and that is practically it! Then on, all of your outgoing data is encrypted thus making it hard for anyone trying to sneak into it to make any sense out of it or even trying to find our your location and many such details. Observe that that red shield at the top left hand corner will go from RED to GREEN (it goes to AMBER while its making an attempt to fully activate itself) indicating that the protection has kicked in. 2. Smart Mode – this is where the app uses its own intelligence to kick in to protect you. However you can also work with it to specify the connections and sites you’d want the app to protect you on. It can be either FULL or partial depending on your situations and preferences. 3. Selected Sites – this is where you can specify the set of sites that you think are SAFE and SECURED and you do not want the app to kick in. You can use the ADD DOMAIN HERE field to add the website/domain and tap on the + button and you’re done! You can add as many sites as you’d want to here. This is easily the COOLEST feature of the app! Imagine you are in countries like China where the networks block you from accessing sites like Facebook, Google and such and you get so damn frustrated! Worry not, Hotshield has you covered there. 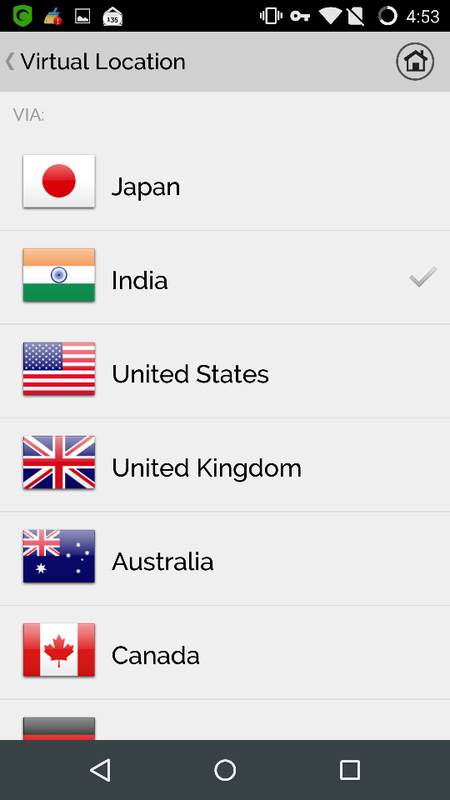 Tap on the VIA option and you will be taken to the VIRTUAL LOCATION page that has a list of countries you can select from to use as your virtual location / proxy. Imagine you selected USA while physically being in China, the servers would think that you are actually in USA and allow you to start accessing the restricted sites specific to China. Well, we do not encourage you to break the laws of the land but merely say that there is a way to access your profiles and content if need be for good purposes 🙂 We tried moving the location to United States and were able to access Pandora Online Radio which was COOL! 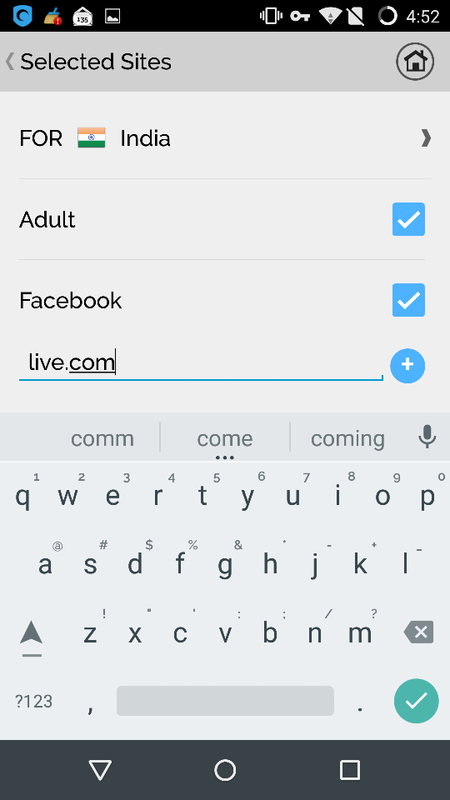 Tapping on the Settings options will take you to a list of options of which most of them we’ve already spoken about. There is the MY ACCOUNT page that tells you of the account details used for signing in and also about the number of devices using the account. 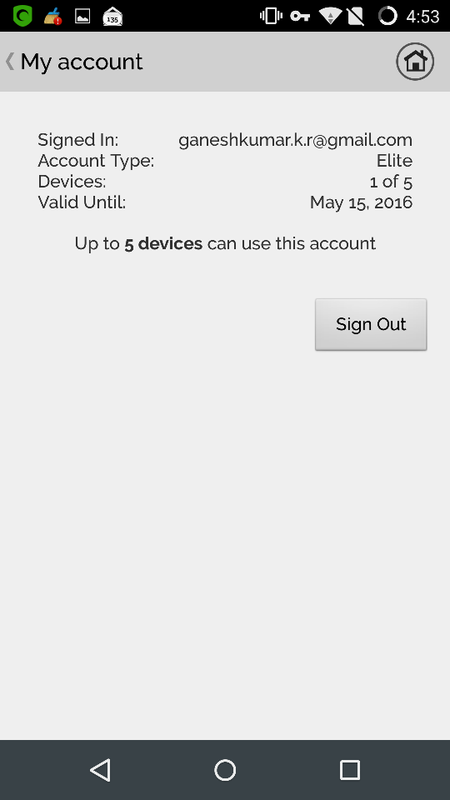 Note that upto 5 devices can use one account and this is where you can keep a tab on it. You can also PAUSE the protection momentarily if need be for one or more reasons. You can also monitor the network activities around the incoming and outgoing data to each and every app and site that is being used. 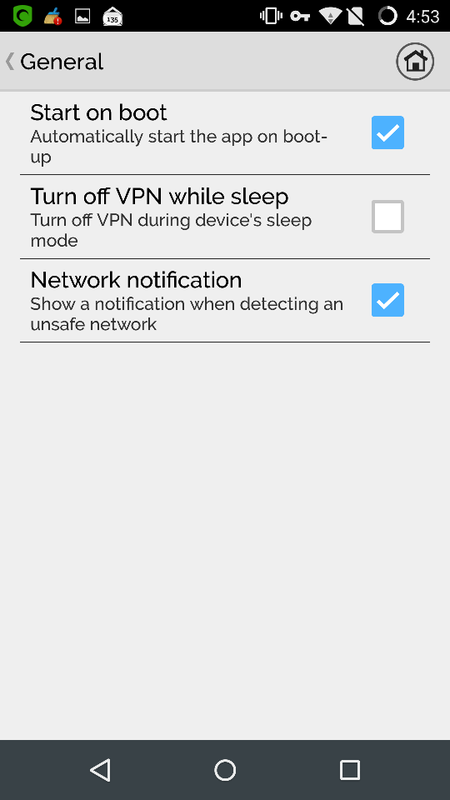 The General Settings will let you specify if you want the VPN to stop working while the device is put to the sleep mode, just to save some battery. You can also manage start up and notifications options here. On the landing page, the app also quickly tells you the amount of total data that has gone out and come in that gives you a heads up of the overall data consumption. Though it doesn’t give a break up of how much of it was on WiFi vs Data connection which is still OK! This is not a data consumption monitoring app. Simple and Intuitive! that is it. Any novice person can easily use this app and one does not have to be technically intelligent. Usually the word VPN freaks out many people as this is usually seen as an IT Admin’s job but not so with this app. Keeps it all simple and quick to get thru and all the visual cues it provides in the form of the shield at the top left hand corner, notifications et all makes it such a peach to use. BRILLIANT is what we will call the UI. The one for your Windows PC: The Hotspot Shield VPN software is also available for Windows PC which encrypts all your Internet activity and routes the packets through AnchorFree’s servers which are located in many different locations. The software decides the server location based on your location, thus making the transactions faster to deliver better and smoother performance. All of your data sent and received is fully encrypted, thus making it hard for anyone trying to sneak into your information. Turning on Hotspot Shield allows users to surf vanilla-HTTP Websites as if they are actually HTTPS-secured sites. The software also keeps the users warned about any malwares encountered and just like in the mobile app, there are cool notifications that are sent out to the users. Having over 300 million downloads across the world and being awarded as one of the most promising companies in the US by Forbes Magazine, as well as the fastest growing companies by Inc. Magazine Hotspot Shield VPN is easily one of the best, trustworthy apps out there that run their own servers. It is SIMPLE to use and has one of the BEST UI we’ve seen. With the Virtual Location option this app is the one that we will highly recommend. Do try out the free option and if you hate the ads too much, there are ad campaigns that you can get into and if lucky it can move you to the elite mode! And we will still say the paid version at 29.99 USD per year is worth it, considering the vulnerable worlds your device will be venturing into across various periods of time. Comment on this article as to why should we give you a free license or why you’d want one! We will announce the winners on 25th of May! P.S. This giveaway is sponsored by AnchorFree. It’s really help to browser restricted websites and its an best VPN app ever with tons of feature. Definitely.. Its my kind of stuff. No need to worry when I connect to 3rd party or free WiFi outside my home / office. I\’m in Iran and many of website and specially social websites \”like facebook\” filtered an restricted by government and I need VPN to open these sites. Would like to win one as it is nice to see news and serials instead of being graphically restricted for some odd reason! Cool Giveaway ! I really want to be anonymous as I am fed up of sites being blocked unnecessarily ! Thanks for this Giveaway ! I need this VPN to unblock country restricted contents and to protect my privacy and I want to use internet safe with VPN protection. 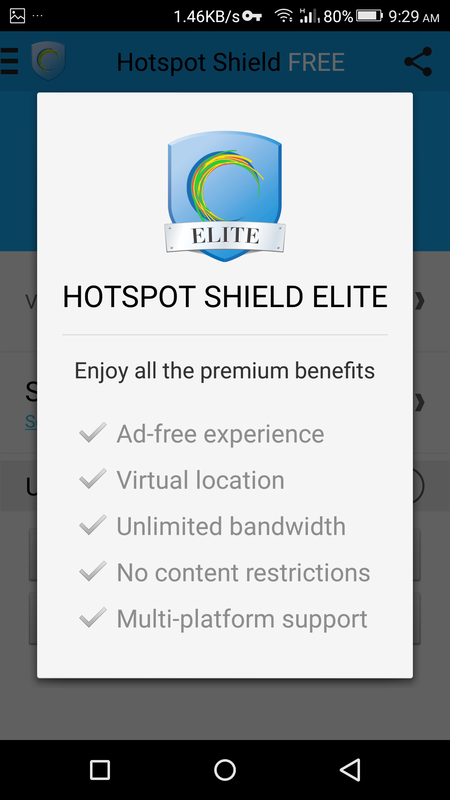 Hotspot sheild is quality vpn, and I need it for securing browsing and banking. It gives me a total privacy to surf on the website. I would like to be safe in the internet, encrypt my data and feel free.I want to protect my identity online by internet hackers.Decent speed with good range of location choices.I like Hotspot it’s a solid vpn so hopefully i’ll win a key. 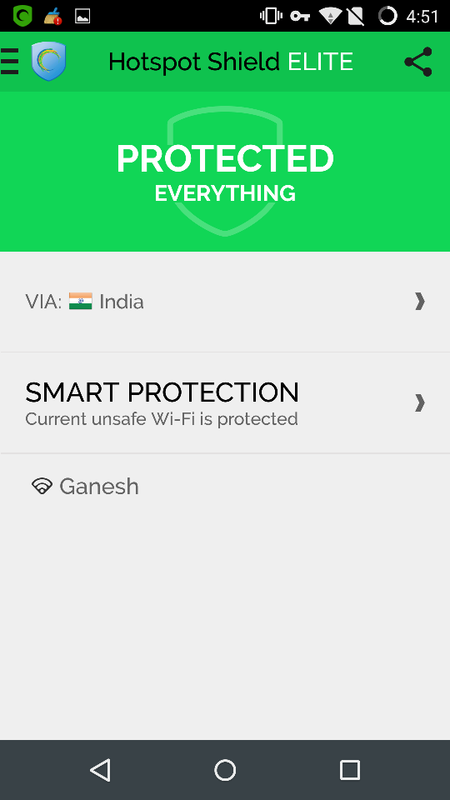 Its great app giving protection online feel safe with it. Many sites blocked like YouTube etc we can view that with help of it. Love\’s it wants it need it……..
What a great giveaway, i would like to win to stop my Government spying on me and collecting my MetaData. Cheers. It is a powerful VPN with multiple servers. It’ll be great to win a license and be secure on the web.I think that the VPN software are extremely useful.You can remove the various restrictions imposed by the state, network administrator. Thanks for great giveaway ! I need VPN to access restricted sites that blocks in our country and to be secured in browsing. I have used many vpn products and none of them comes close to what Hotspot Shield does.. I have no problems and I do pay the monthly subscription as it is worth every cent!! I would love to have the full year subscription because I see myself staying with your VPN provider for good.. You guys have me hooked and I aint leaving for nothing.. I have recommended this to a lot of people and they now pay for subscriptions and they all agree this is the best product for VPN services.. Keep up the good work guys!! Hotspot Sheild help us a lot by encrypting and securing our internet connecting to the outside world. The best part of VPN is that, you can use them to bypass regional restricts placed by some sites like HULU, Netflix, etc. I also want to add that they help a lot in places were citizens are threatened by governments. Thanks form Caracas – Venezuela. Our government is so corrupted, that even with the biggest oil reserves in the world, we have the biggest economic inflation, and professional people is commonly living with less of a dollar per day. Even when we\’re strong enough for survive and go forward, any chance of protection against a narco-state with Hotspot Shield is strongly desirable, and deeply welcome. I need Hotspot to avoid country restricted content and also in some cases I prefer to stay as anonymous as possible. 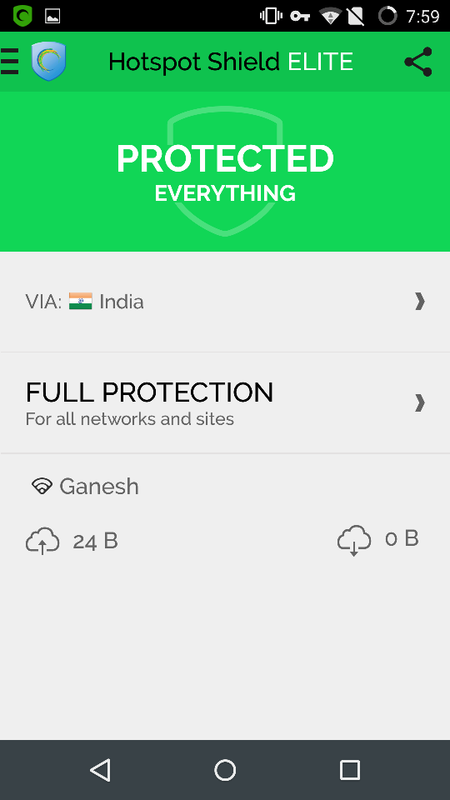 Best vpn service out there decent speed with good range of location choices and i would like to be safe in the internet, encrypt my data and feel free. Would be nice to be able to use mobile internet without worry. A free VPN subscription, even if only for a year, would be very helpful. With every one from the government to private companies keeping an eye on what we everyone is doing, a VPN is a must. Pretty tired of the country restrictions all around so the famous will come in very handy..
Hotspot VPN service should be an interesting service because it would add to the many VPN out there. It sure would be interesting also to take advantage of this giveaway! Identity and privacy of using VPN to surf the web safely protect yourself from prying eyes, and to bypass access restrictions on the content you want to access. This is very impressive and eye opener review article, These days I am using NordVPN.. This is very good online VPN service Provider.but Now I want to change I think Sheild VPN is another good alternatives..